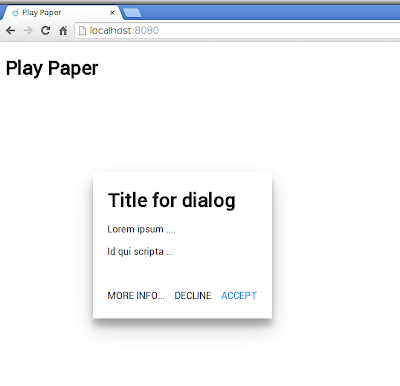 I love me transitions and animations, so I will take one more day to explore Paper Elements in Polymer.dart. Paper are the Polymer spin on Google's Material Design. Although I still worry that Material tends to look too Googly, I cannot argue with the concepts and emphasis that Material has for design. So I keep playing and learning. What is most remarkable to me is that it worked so easily. A while back, I could barely get Core Elements to work in Polymer.dart. Now both Core and Paper work with ease. The team behind Polymer.dart has been active (thanks folks!). It seems like <paper-dialog-transition> is adding those first two copies of itself for a reason. I am ultimately unable to figure out why by reading the code. Or rather, I stumble across some demo code that seems to do use the element. I add a similar <paper-dialog> with a transition of paper-dialog-transition-center. The <paper-dialog-transition> transitions work nicely with the <paper-dialog> elements. Toggling the dialog, clicking elsewhere, clicking decline, even hitting escape all result in the transition reversing itself. All I needed to make this work was the addition of transition attributes and the import of paper_dialog_transition.html (removing this import disables the transitions). I have to admit that the usage of <paper-dialog-transition> was not obvious to me. By extension, I have the feeling that I am a little weak on core-transition-css (which paper-dialog-transition extends). This may be worth a little more exploration. Tomorrow.